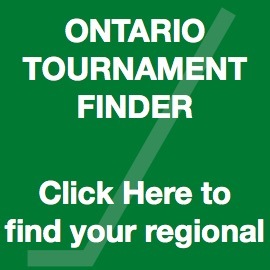 Individual Tournaments will be posting their 2019-2020 dates and contact info shortly. In the meantime please use last years dates and contacts as a guide. Welcome to the International Silver Stick® Hockey Association Inc. Website as we enter the 2018-19 hockey season and our 61st year hosting hockey tournaments across North America! We currently host 15 American Regional Qualifying Tournaments, 28 Canadian Qualifying Tournaments as well as our International Finals Tournaments consisting of 8 Boys, 4 Girl’s and our Sled Hockey. We would encourage you to browse through our current website including the Larry McGrath Memorial Scholarship, Hockey Hall of Fame and the Silver Stick Story. This will give you an insight as to how Silver Stick® operates. Our Regional tournaments are unique in that if you are a Champion of the Division that you have competed in, this entitles you the right to participate in an International Finals tournament competing against other teams who had been successful in winning their Regional Qualifying tournament. Our Motto, “Citizenship and International Good will through Silver Stick® Hockey will be experienced as teams from both Canada and the United States compete among each other for the coveted sterling silver championship pin. 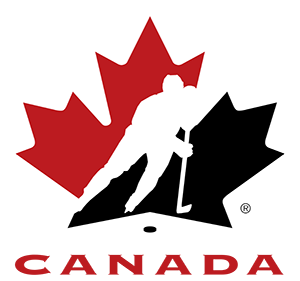 International Silver Stick would like to wish all the teams competing in Silver Stick® tournaments across North America to play safe and fair, have fun and enjoy the experience of International Silver Stick® Hockey which you will remember for many years to come. 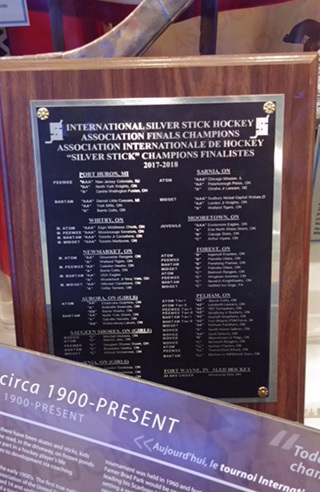 The 2018 plaque listing all Finals Champions has been unveiled at the Hockey Hall of Fame in Toronto. Be sure to visit the Silver Stick display during your next trip to the HHOF. Congratulations to the following 2017-18 Larry McGrath Scholarship recipients! Each Recipient has been awarded a $2000.00 Scholarship towards post secondary education. International Silver Stick® would like to announce the addition of Novice AA, A, B and C finals to the Pelham Finals tournament. No tournaments are currently ongoing.